La Réserve Royale was the proud exclusive beer partner of the 10 year Anniversary event of Dinner in the Sky. 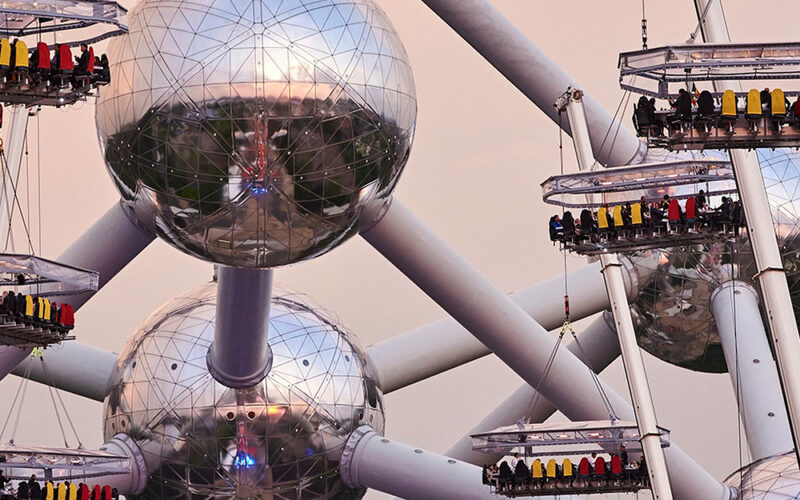 This event has been held in front of the Atomium in Brussels with 30 Michelin-starred Chefs during 5 days. Dinner in the Sky has been shining bright in 55 countries, recently including Malaysia, Vietnam and Guatemala – and soon, Peru, Malta and Thailand. So many mythical places seen from above : The Strip in Las Vegas, Sydney Bay, the Champ de Mars in Paris, Monaco’s marina, the City of the Gods in Teotihuacan, the medina in Marrakech, etc. So many great Chefs like Michel Troisgros, Paco Roncero, Joël Robuchon, Heston Blumenthal, Pierre Gagnaire, etc. Among the most surreal gastronomic concepts, Dinner in the Sky definitely has its place at the top. In 10 years, Dinner in the Sky has gained global fame and has built a solid reputation among the Foodies community throughout the world. Chef Lionel Rigolet created a menu around Réserve Royale and his exclusive creations were served for Lunch and 2 times for Dinner every day, during 5 days. Lionel Rigolet is the chef from the most famous restaurant in Belgium, “Comme chez soi” located in Brussels. Pierre Wynants, Lionel’s father in law, was the chef of Comme chez soi scoring 3 Michelin Stars for 27 years in a row. This gastronomy icon has been starred by the Michelin guide since 1953 and has celebrated its 90 years of creation in 2016. For the 10 Year Anniversary celebration of Dinner in the Sky, more than 4000 people have enjoyed a meal with a glass of Réserve Royale at 50m in the sky in the very front of the Atomium. Other partners include champagne Laurent Perrier, Nespresso, Maison Dandoy, Paris Match, SMEG, Quintessentially Lifestyle, Fever Tree, Thalys, The Hotel and San Pellegrino.